The first day at a new school can be rough, especially when your slightly insane father has just purchased a convenience store, the lead reporter on the school newspaper won't stop pestering you, the school bully finds beating you up highly cathartic, and your new school happens to be packed with ghosts and violent spirits. 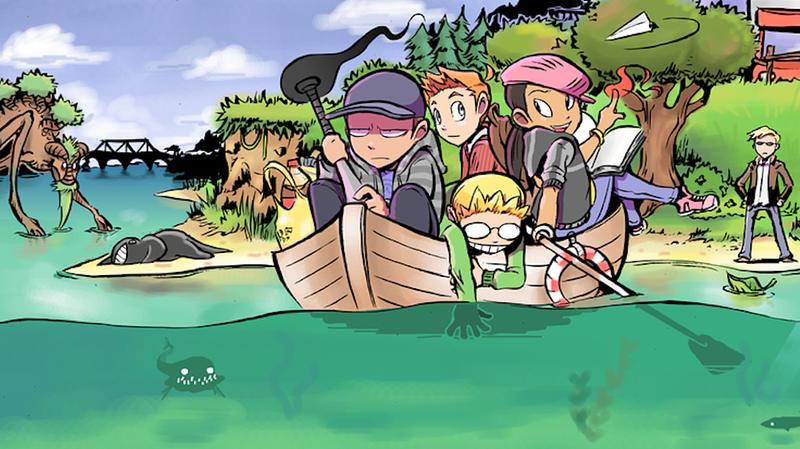 That's what Max has to contend with in Zack Morrison's webcomic Paranatural. But hey, at least he has some keen new superpowers—ones that might get him killed. After their mother dies, Max and Zoey move to Mayview, their father's hometown. While his father lives out his childhood dream of owning and operating a convenience store, Max gets acquainted with his new school, which may as well double as a looney bin. He immediately attracts the attention of Johnny, the school bully (who seems to quite like Max, although he likes the idea of punching his face in more). Suzy, the indefatigable president of the Journalism Club, seems to think she can get convince Max to join by sheer force of will. And then there are the purple blobs Max starts seeing everywhere, and the phantom who seems to haunt his bedroom. It's all connected to the mysterious Activity Club and Mr. Spender, the history teacher who always wears sunglasses, even indoors. As Max comes to realize that he's seeing the ghosts of dead people as well as powerful spirits, he starts to develop powers to battle the peskier of those spirits. As awesome as those powers are, however, they mean Max is coming face-to-fang-filled-face with some dangerous beasties, including the one responsible for his powers. Folks who have recommended Paranatural to me tend to emphasize that it's an incredibly funny comic, and it is. Morrison has a knack for twisting familiar jokes in unexpected ways and mocking the conventions of manga and young adult comics without functioning as an outright parody. But as the comic delves deeper into its own mythology, it becomes clear that Morrison has a rich story sitting behind all that humor. While some of the 12-year-old spirit fighters at Mayview Middle School are having a grand time with their awesome superpowers, the proximity to ancient and powerful spirits has a more profound effect on others. Figuring out just whom he should trust may not prove easy for Max—and even as his body is in constant danger from the spirit world, his soul might be in even greater peril.